Specialising in bespoke vinyl flooring, sheet rubber flooring and linoleum flooring for all areas of the marketplace, from small on suite bathrooms up to a large hospital canteens and factory floors. 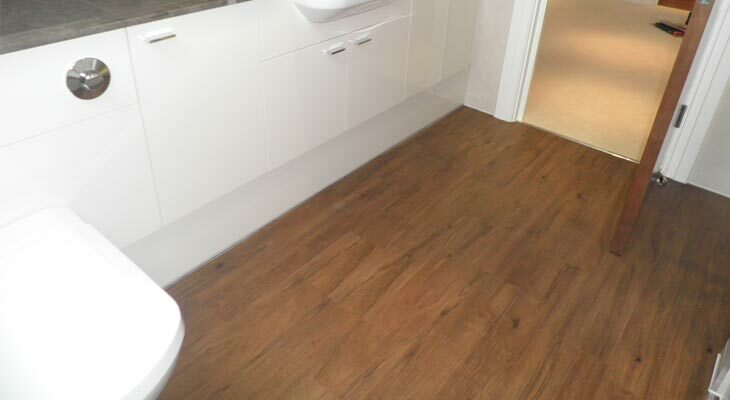 Euro-Pean Flooring in Horsham specialises in bespoke vinyl flooring, sheet rubber flooring and linoleum flooring for all areas of the marketplace, from small on suite bathrooms up to large hospital canteens and factory floors. We of course install more typical wood and tile effect vinyl flooring and decorative luxury vinyl tiles (such as Karndean and Amtico), but we love the ‘something a bit different’ – utilising for example accentuating strips, borders, marble edging and mixing different batches and colours (often with carpet) to form bespoke vinyl flooring designs. With vinyl flooring being just a few millimetres thick, sub-floor preparation is vitally important (the base must be as flat, strong and stable as possible to ensure longevity and best finished appearance). We pride ourselves on using the highest quality levelling compounds and adhesives to ensure the sub-floor is perfect before laying the final top layer. As a company we offer advice and solutions for all sheet flooring solutions including safety vinyl flooring in wet and hygienic areas, and areas with wear and slip issues, plus we have extensive experience in sports floors where cushioning and protecting against injury is key. For all vinyl, rubber and lino flooring enquiries please either telephone us or send us a message. Vinyl flooring has become extremely popular since the 1950’s, particularly for those designing and working in heavy-traffic locations such as the retail environment, or for rooms that must be kept clean such as hospital operating theatres. Unlike in the 1950’s, advances in technology have meant that Vinyl flooring is now a very affordable and versatile flooring solution in the home, enhancing any room. Installations of luxury vinyl tiles made by companies such as Karndean and Amtico are becoming ever-increasingly popular for us at Euro-Pean Flooring in Horsham, especially in luxury Horsham, Crawley and Cobham homes. This lifelike vinyl flooring is available in a wide range of effects from slate, marble, stone, ceramic, wood, mosaic and metal to terracotta and glass. 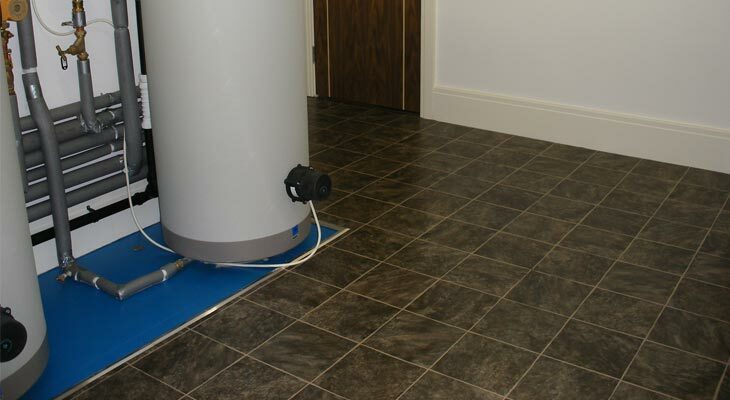 By employing the use of a vinyl floor, you can have the look of stone or wood flooring without the need for expensive subfloor preparations, whilst also avoiding the coldness often associated with hard flooring. 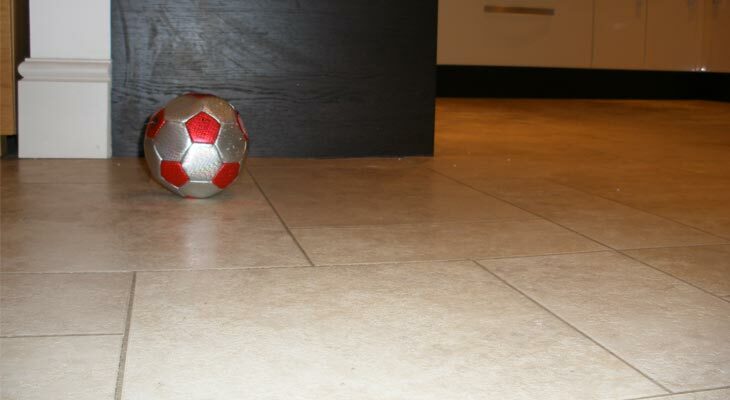 A ceramic floor that never cracks! Vinyl flooring is one of a number of resilient floors. These floors are known as resilient floors due to their bounce-back-ability. Other resilient floors include rubber or linoleum. In general, there are two types of vinyl flooring – sheet flooring and tile. In addition, there are two basic categories of vinyl tile – solid vinyl and vinyl composition – and three basic categories of vinyl sheet flooring – homogeneous, inlaid and layered composite. These products differ in manufacturing process and content. In fact, some floors contain as much as 55 percent vinyl (polyvinyl chloride or PVC) while others may contain as little as 11 percent vinyl, yet each of these floors is referred to as vinyl flooring. In addition to vinyl resin, vinyl floors typically contain fillers, plasticizers, stabilizers and pigments. 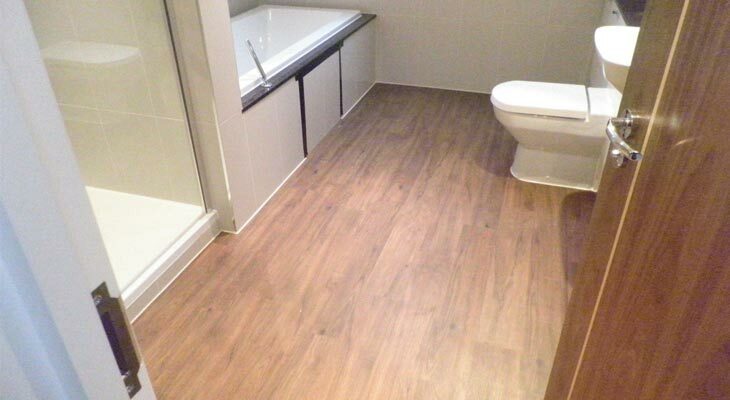 Vinyl floors are available from our Horsham flooring base in either tile or sheet form. 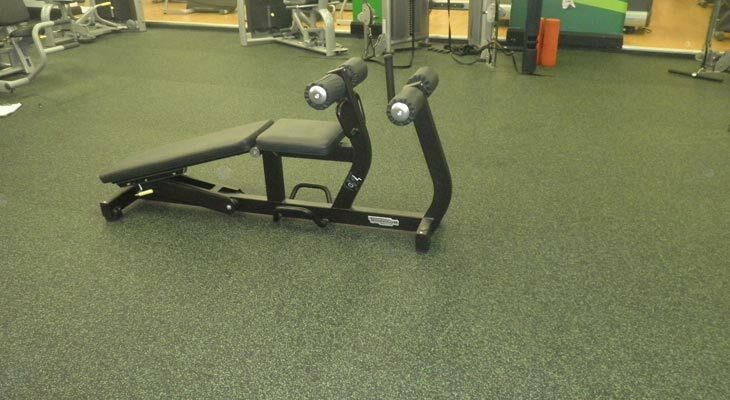 They can be used for both commercial flooring and domestic flooring use. New technologies in recent years have improved vinyl flooring performance, especially in the areas of durability against rips, tears and surface damage. Because resilient floors are durable, easier to maintain and more moisture-resistant than many alternative materials, vinyl flooring is preferred for use in residential kitchens and bathrooms, as well as in healthcare facilities and commercial and retail establishments. The first Resilient floor was a rubber floor tile which debuted sometime in the 12th to 13th centuries. It was only available in limited colours and its use diminished. The use of plain, square, undecorated red clay tiles became common throughout Europe during the 18th century. Linoleum flooring was invented and patented in 1845. It was first manufactured in Scotland in the 1860s, and the first U.S. plant was built in 1872. Linoleum flooring remained popular until after World War II, when easy-to-maintain and durable vinyl flooring was introduced. In 1894, Philadelphia architect Frank Furness patented a system for rubber floor tiles. Colours were limited, but the floor tiles could be laid in geometric patterns to produce an eye-catching design. By the end of the century these flooring tiles were being mechanically fixed to the floor and soon adhesive advances meant that they could be stuck. 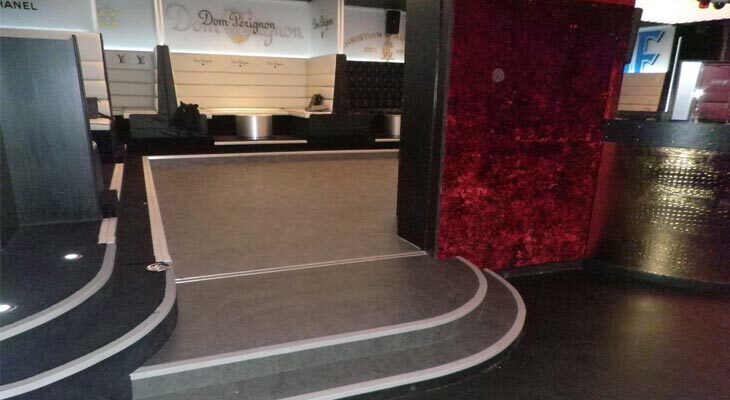 Rubber floor tiles were extremely durable, easy to clean, had excellent acoustic properties and easy to install. However, they tended to stain and react badly to ozone and oxygen. Their use was limited as they also reacted with high levels of alkali commonly found in subfloors or basements. The first cork tile floor was introduced in 1904, and became the most popular type of resilient flooring in the 1920s. It was available in a limited range of colours and designs, but was expensive and porous. Then, in 1933, vinyl flooring arrived on the scene in the form of a VCT or vinyl composite tile. During the second world war most vinyl was used in the manufacture of military items and this halted the progress of vinyl as floor covering. Originally only used in heavy traffic areas, vinyl flooring eventually became the most popular choice for flooring in just about any hard-surface application. 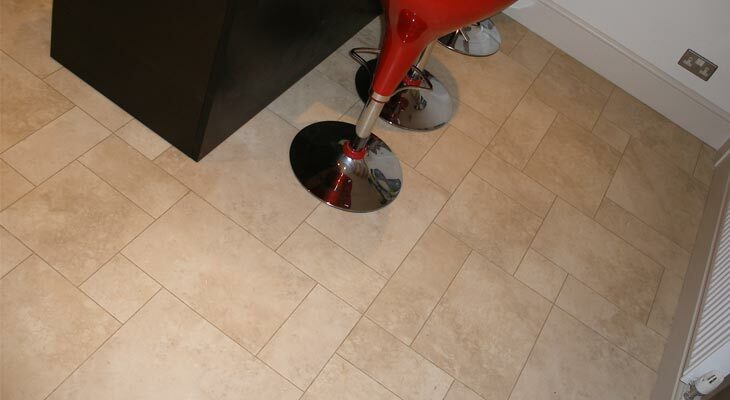 Most recently figures suggest that vinyl flooring is second only to carpets for sales in the UK. Many factors should be taken into consideration when determining which flooring material to select for a specific application. For example, the flooring may need to stand up to rolling carts or support standing (static) loads. Moisture resistance may be critical, or resistance to fading. Horsham based Euro-Pean Flooring can provide detailed information on the performance characteristics of each type of floor finish, as well as proper installation and maintenance instructions to avoid damage and ensure a long lasting, aesthetically pleasing floor for years to come. Vinyl sheet flooring and tile are available in almost limitless designs and colour options. Vinyl tile flooring is available in shapes that can be custom made and fitted to form patterns and designs to suit the home or workplace. Corporate logos can be designed and cut into the vinyl and Euro-Pean Flooring Solutions are trained in the installation of Karndean and Amtico luxury vinyl tiles which can adopt the appearance of wood, metals, glass and even your own photograph. Vinyl flooring will reduce noise and provide comfort underfoot. It can be fitted in a Horsham or London home by Euro-Pean Flooring onto acoustic underlay, which reduces sound impact transmission by up to 30db. 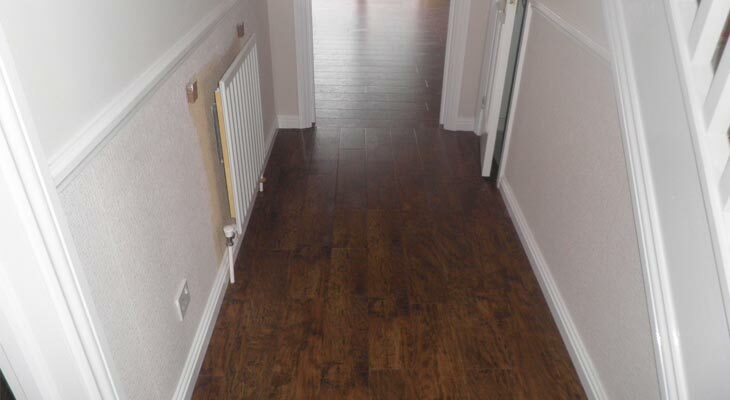 Whilst vinyl is not the most resilient floor, it offers a lot more give than laminates or stone flooring. Vinyl flooring is durable and easy to maintain. Like linoleum the amount of time and effort needed to keep the floor looking its best is determined by a number of factors such as traffic levels and cleaning practices, but on the whole vinyl should give you a long lasting easily cleaned floor both at home and at work. Safety flooring is becoming the mainstay of the vinyl industry. Almost every manufacturer has ranges that are designed solely to improve slip resistance. 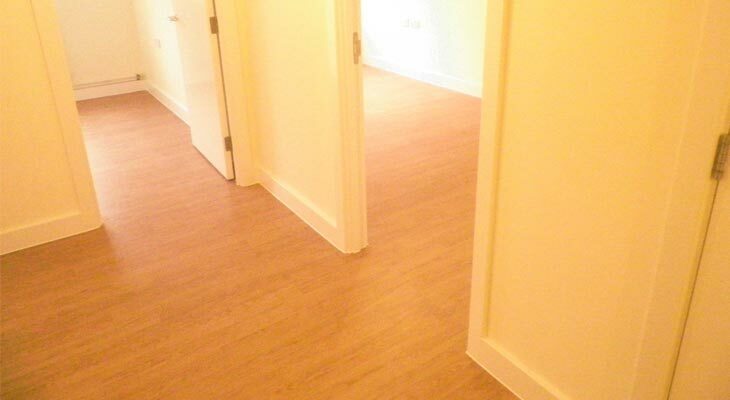 These floors are suitable for a variety of commercial and institutional applications. Because they are vinyl, these slip-resistant surfaces can be easily cleaned. Other special characteristics can also be incorporated including oil and grease resistance or electrostatic resistance. 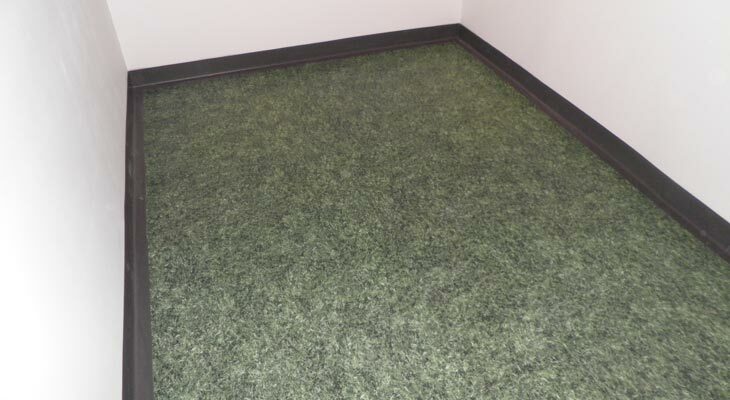 Vinyl flooring is often used in healthcare facilities because of its advantages over carpet. It is almost impervious to water and therefore can deal with the day to day spills that are unavoidable. Euro-Pean Flooring’s sheet vinyl floor installations offer sealed or welded seams that prevent contaminants from being lodged in the joint. Sheets are normally two metres wide and with our experience and expertise we can minimise the amounts of seams necessary to reduce the risk of bacterial growth. Most stains can be easily removed. 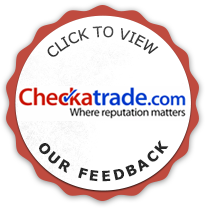 Check with Euro-Pean Flooring for complete maintenance instructions. For hypersensitive populations, where mould allergies may be a problem, vinyl flooring offers advantages as well. Researchers at the University of Nevada at Las Vegas have found that carpet flooring can produce high airborne mould counts, which can actually be aggravated by vacuuming. Vinyl flooring, on the other hand, can be cleaned without dispersing high levels of mould into the air. Sheet vinyl flooring is increasingly being used in all sorts of indoor sports venues. It offers a more durable and decorative alternative to wood flooring. If a suitable underlay is fitted sheet vinyl floors can also offer good sound reduction as well as cushioning properties to the sports user. It is also cheaper to install than wood and needs little maintenance. Vinyl floors are not always recommended for use in commercial kitchens, although vinyl flooring is commonly used in residential kitchens. At Euro-Pean Flooring based in Horsham we always check with the end users to ascertain whether sheet vinyl flooring is the correct product. High temperatures and sharp impact can damage vinyl, and after our free survey we will offer the best product for your environment. Vinyl flooring also may not be recommended for automotive maintenance areas or automotive showroom areas unless the flooring is protected from oil spills and contact with rubber tyres. In addition, vinyl flooring is not recommended for outdoor installation, where excessive heat, cold or sunlight may cause fading and discoloration. Impact resistance – Impact resistance refers to the amount of load or impact a floor can take. 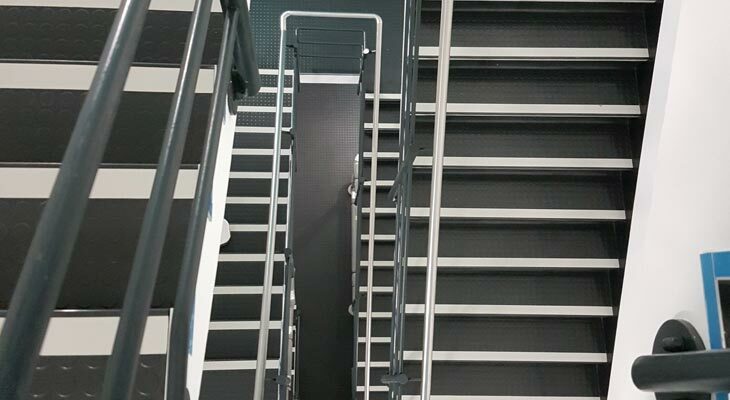 Whilst very hard floors are often thought of as the strongest, this can be misleading. 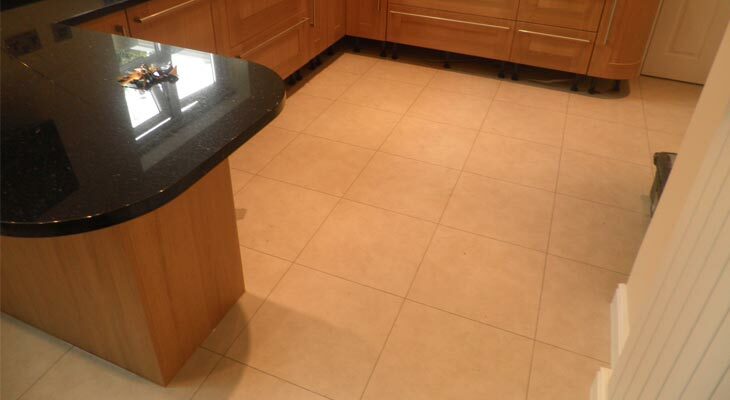 If for example something is dropped on a ceramic or stone floor cracking can occur. If the same object is dropped on resilient floors they can often survive without cracking and in some instances protect the subfloor. Bullet proof flooring is available should you be that way inclined. Moisture resistance – Most vinyl floors are virtually impervious to moisture ingress. The subfloor, however, should always be checked for moisture before the installation. Should the subfloor contain more moisture than recommended in BS8203 then remedial treatments can easily be factored into the schedule of works. By testing properly and acting on the findings costly replacements can be avoided. Euro-Pean Flooring are experts at subfloor testing, corrections and maintenance. UV stability – Almost any material will be susceptible to a certain amount of fading if exposed to strong sources of daylight. Certain flooring products are available that will limit the amount of fade experienced. Light reflectivity – This is a test that measures the amount of light reflected by a floor. Some vinyl floors have poor reflective properties that mean they should not be used where light sources are at a premium. Resistance to chemical attack – If the application is in a highly sensitive area such as a pharmaceutical factory floor, attention should be paid to the product’s resistance to chemicals. Most resilient floors will offer a good deal of protection to every day chemical spillages such as bleach etc , as long as the spill is cleared quickly. But for specialist information, Euro-Pean Flooring can provide you with relevant manufacturer information tailored to your environment. Acoustic reduction – Some vinyl floors will come with a built in backing. These are called cushion floors and can help reduce sound transmission between floors. If this is not enough then either specialist underlay or acoustic backings can be added to the top wear layer thus reducing the sound impact by up 30db. Fire retardance and heat performance – Most manufacturers test their floors to reach minimum standards. And at Euro-Pean Flooring we only use products that meet the latest BS and EN standards for fire. Generally vinyl flooring will not promote spread of flame but when burning can release some chemicals that can be damaging to health. Whether you are installing vinyl flooring in a luxury Horsham home or in a hospital theatre, specific product information related to installation and maintenance can always be found by contacting the manufacturer or visit the manufacturer’s web site. Generally speaking it is best to install all types of flooring after other trades such as painting. This will avoid any damage to the floor caused by careless plasterers, painters or carpenters. As with all types of flooring installations, preparation is the key to the success or otherwise of vinyl. The floor should be made as flat and smooth as possible using levelling compounds which can now even be applied over flexible wooden floorboards. 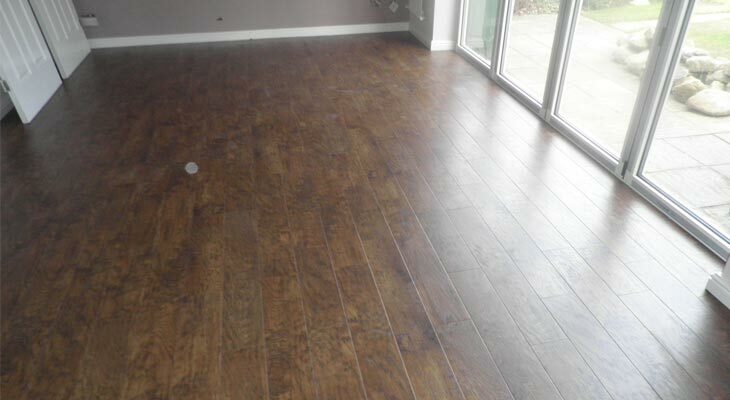 Once fitted the vinyl floor should not be trafficked until the adhesive has dried. Should chemicals or heavy traffic be expected it is better still to wait until the adhesive has fully chemically cured. The time this takes varies from adhesive to adhesive and should be advised by your vinyl flooring installer. 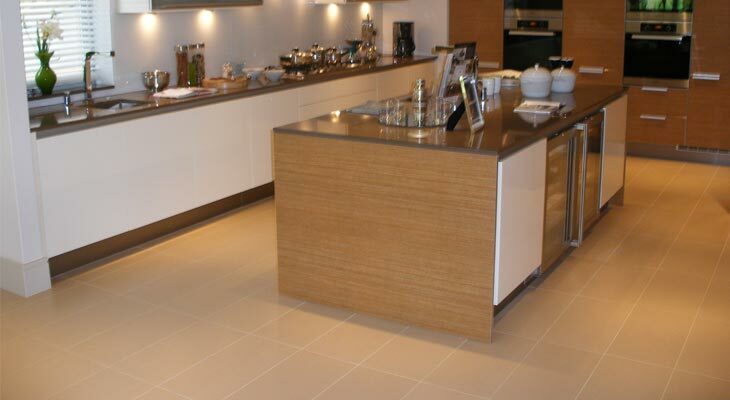 Horsham based Euro-Pean Flooring will always go that extra bit to ensure customer understanding and satisfaction. Temperature should be between 16 and 18 degrees centigrade. The subfloor should be clean, dry and free from any contaminates. Moisture levels should not exceed 75% R.H. as prescribed in BS8203. Unless the above conditions can be met, it would be advisable to delay the floor installation and wait for better conditions. 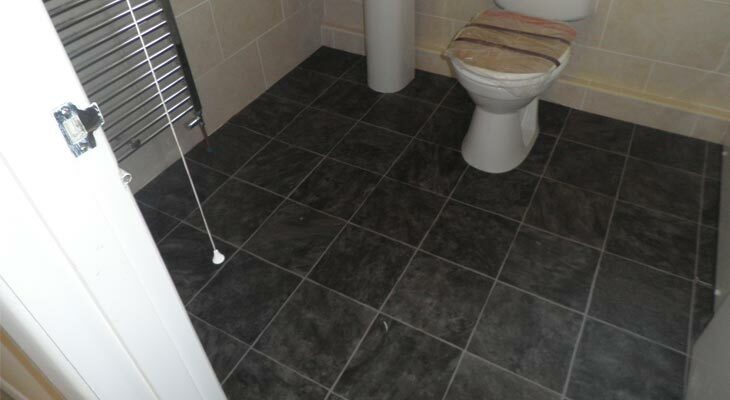 On the whole vinyl flooring is among the cheaper range of floor coverings available today. 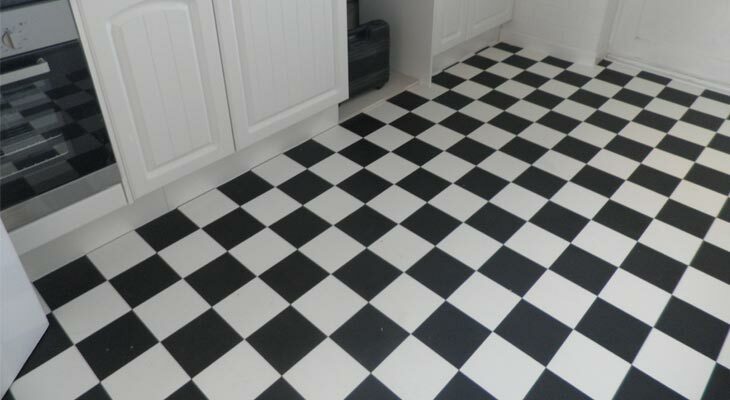 It can cost as little as £5.00 per square meter but equally for some luxury vinyl flooring tile installations the cost can be upwards of £100.00 per metre. Like linoleum flooring, vinyl is very easy to maintain. Some products come with a protective P.U. coating applied in the factory. Others with a hard wear layer to aid its durability. Regular maintenance is the key to a successful project, which will normally involve daily sweeping or dust mopping. The removal of grit and other small sharp grime is the key. Specialist vinyl floor cleaning chemicals are available, with Amtico and Karndean offering their own range of easy to use maintenance products. 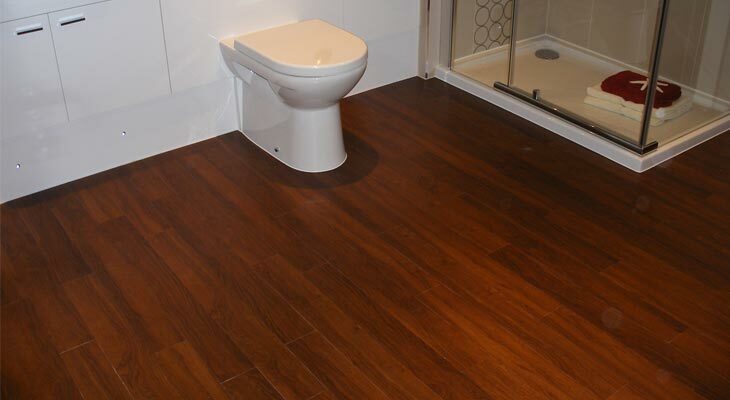 Generally speaking vinyl flooring is not recognised as being particularly environmentally friendly. It is a manmade product made from PVC and plasticisers. Both the manufacturing process and ingredients are not always the most energy efficient or green but manufacturers are constantly striving to reduce energy use and create more environmentally friendly products. Chlorine free vinyl is already available and this is a far green friendlier product than early vinyl. 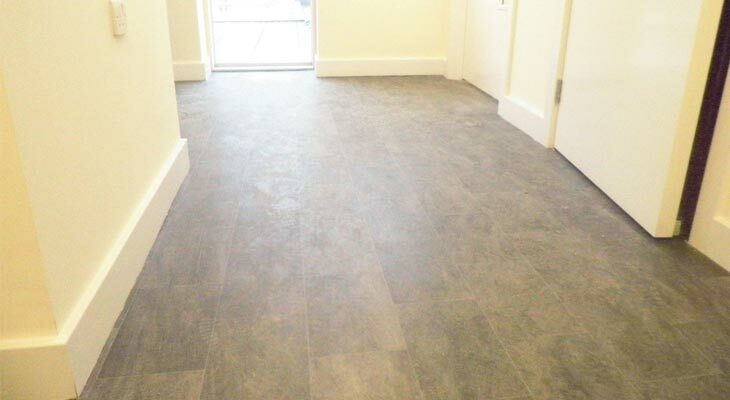 Vinyl flooring is a highly versatile, durable and attractive option for any situation. 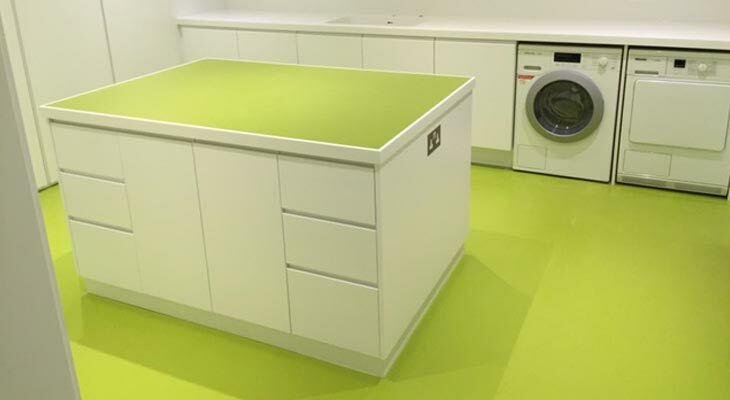 It has all the wear of linoleum, all the colours of the rainbow and can be fitted anywhere to suit any budget. 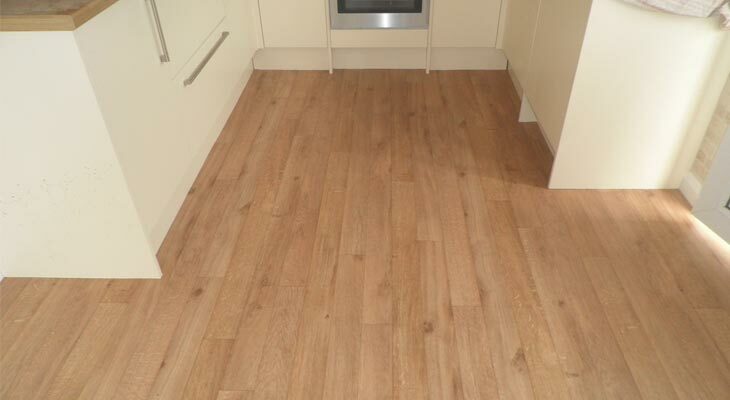 If you live anywhere in the South East of England, from Horsham to Croydon or London, then look no further than Euro-Pean Flooring for your vinyl flooring installation.